So you’re planning a party for a video game lover in your life. Whether it’s a family member or a close friend, we know you want to give them the best birthday party possible. The options are overwhelming, and you’re not sure what will make the birthday girl or boy happy. So what should you do? This is where GameTruck Colorado Springs comes in. If you’re in Colorado Springs, Castle Rock, Palmer Lake, Monument or anywhere nearby, we have the perfect party for you. Here’s the best part: We do the planning. Our revolutionary approach to video gaming will make this birthday party one the guest of honor won’t ever forget. Here’s how it works: Our team brings the party to you. We have mobile gaming theaters that can be customized for your specific party needs. Our parties include over 80 video game titles and modern consoles, including the XBox One, PlayStation 4, Wii U and Nintendo Switch. On top of that, we have high-definition TVs, so every game is played on an impressive screen. Our parties aren’t only for serious gamers, though. Because of our variety in video games and coaches that ensure the party runs smoothly, even the less experienced players at your party will feel at ease. Here’s another reason you’ll love us. We walk with you every step of the planning process, and our manager Seth Rosebaugh makes sure nothing is overlooked. The GameTruck Colorado Springs team is professional, experienced and well-prepared. We have backup generators to make sure the party never stops, and we even provide invitations. When your party ends and everyone goes home, you’ll be grateful you chose us – and the video game lover in your life will be thanking you for years to come. What’s stopping you? Call us at 866-253-3191 or book your party online today. When you book an event with GameTruck Colorado Springs, you and your guests are guaranteed to have a blast. With our state-of-the-art equipment and engaging GameCoaches who manage the event, our mobile video game parties are unforgettable and easy to host. Here’s what you need to know about throwing a GameTruck Party with GameTruck Colorado Springs. GameTruck Colorado Springs’ unique mobile gaming theaters offer the most fun you will have playing video games with your friends. Our trucks boast HDTVs with beautiful visuals, amazing sound systems, and comfortable couches that make your event extra special. GameTruck offers the latest consoles and video games so you and your guests can enjoy playing the newest games on the market. Our state-of-the-art equipment makes it a party, while our fun and experienced GameCoaches make it memorable. Our video game trucks deliver the fun directly to your doorstep. Booking an event with GameTruck Colorado Springs is simple and hassle-free, and parents love how convenient our parties are. Our experienced GameCoaches organize, plan, and manage the entire party from setup to cleanup so your only responsibility is to relax and join in on the fun! From the first time you call GameTruck to the moment our truck rolls away, we work hard to make your experience perfect. GameTruck video game parties offer fun for people of all ages. We carry a wide selection of video games ranging from E to M, so people of all ages are guaranteed to find a game they love. Whether you’re throwing a birthday party for your 7-year-old child or hosting a team building event for your employees, everyone will have an amazing time at a GameTruck Colorado Springs party. 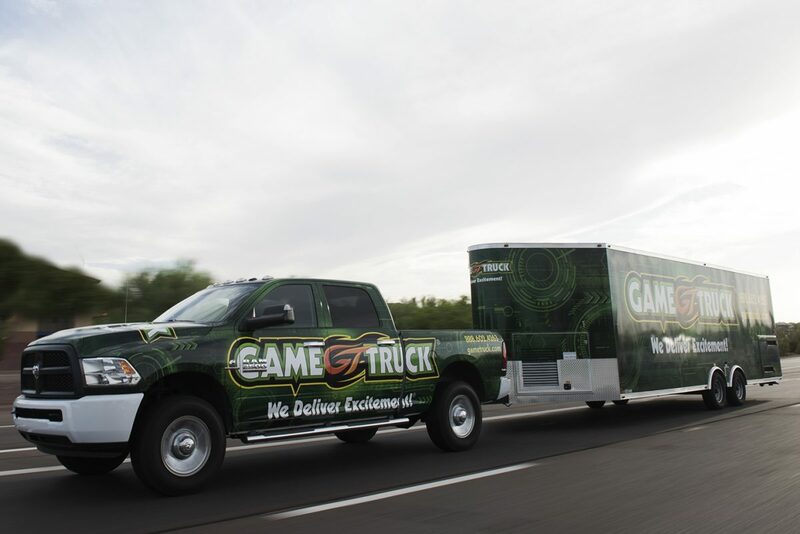 Over the years, GameTruck Colorado Springs has developed a reputation for being the most reliable mobile video game company in the area. Our commitment to reliability, safety, and communication makes us the best in the business. We perform regular preventative maintenance on our trucks, as well as invest in backup generators for each trailer, to ensure that when it comes time for your party, we are prepared. GameTruck also carries the proper insurance for our trucks to ensure that you and your guests are always safe during our events. Finally, you will never have to worry about tracking us down since we frequently communicate with you to confirm the details and answer any questions you may have. GameTruck Colorado Springs isn’t just for birthday parties. Regardless of the size of your event, GameTruck can accommodate any group event. Our video game parties are great for any type of special event, including school events, fundraisers, church groups, family reunions, graduations, company picnics, and the list goes on. Every GameTruck event is customized to fit your location, party size, and unique needs. Throwing a party with GameTruck Colorado Springs is the perfect way to celebrate a special occasion. Our team is committed to throwing you the perfect party and we work hard to make the entire experience a positive one. To learn more about our video game parties or to book an event, contact GameTruck Colorado Springs today at (719) 247-2664. Whether it’s a festival, carnival, or PTO event, GameTruck Colorado Springs offers the perfect entertainment for any type of school event. Our video game trucks provide hours of fun for people of all ages. 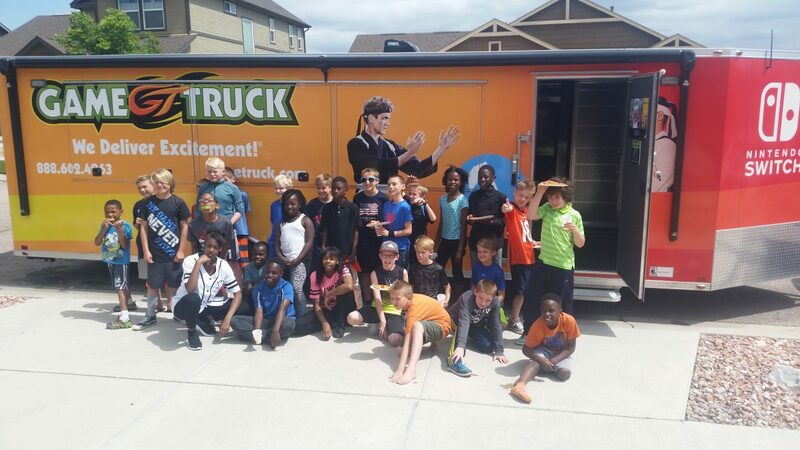 Our state-of-the-art video game theaters, experienced GameCoaches, and commitment to reliability make GameTruck an ideal choice for school events. 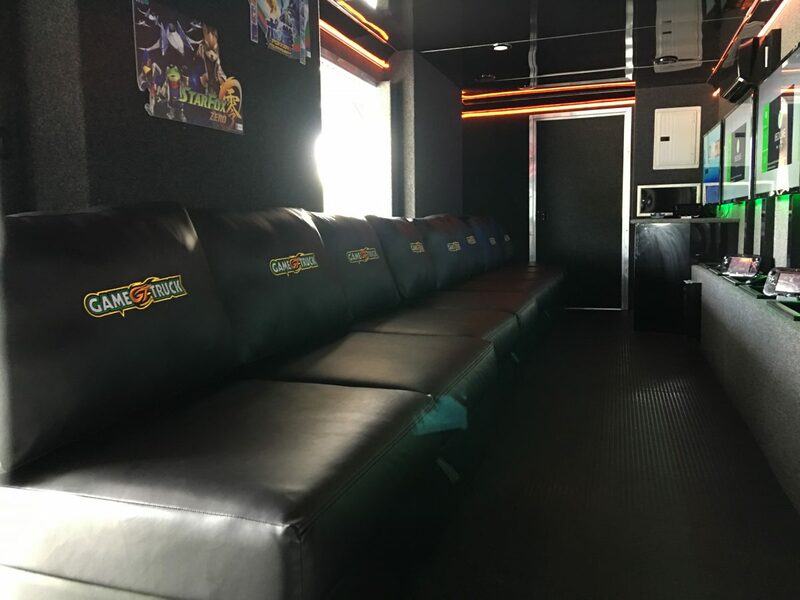 Our mobile video game theaters boast comfortable couches, widescreen HDTVs, and amazing sound systems. We clean and inspect our video game trucks before and after each event to ensure that our equipment is always clean and functional. We also perform regular maintenance on our trucks to make sure that your event will never be canceled due to equipment issues. Our experienced and engaging GameCoaches manage the entire event for you and make sure that every guest has a blast. With our staff managing turns, our events can rotate up to 60 players an hour, which means everyone gets a turn and can keep coming back for more fun. GameTruck Colorado Springs’ staff are masters at hosting events and they make sure that everything runs smoothly from start to finish. One of the best things about GameTruck Colorado Springs is that it provides fun for all ages. Whether it’s an elementary school carnival or a high school post-prom event, you can depend on us to deliver the excitement. We carry an enormous variety of games ranging from E to M. If your party is for younger kids, don’t worry, our GameCoaches will consult with you before the event to make sure all the games are age-appropriate. GameTruck Colorado Springs’ video game parties deliver hours of interactive entertainment perfect for school events. Video games provide a fun and safe activity that promote bonding through collaboration and a bit of healthy competition. With a wide selection of games that appeal to every interest, your guests are guaranteed to have a great time. If the weather forecast isn’t looking great for the day of your school event, you don’t need to worry with GameTruck. Our trailers are climate-controlled and, of course, dry. And, just for extra precaution, if a storm happens to knock out the power, your party will still go on since our trucks have backup generators. GameTruck Colorado Springs is committed to making your school event a success. We have developed a reputation for being the most reliable mobile video game company in Colorado and we work hard to live up to that. When you book an event with us, you can count on us to show up and make your school event a memorable one. A GameTruck video game party is the best way to make your school event successful and unforgettable. Our staff is dedicated to throwing the perfect video game party and we work hard to plan every detail, communicate with you every step of the way, and deliver the excitement. To find out more information or to book an event, give GameTruck Colorado Springs a call today at (719) 247-2664!